Introduction to subseries “Super Friends” (including list of interviewees). Yes, I was told that. It gave Wally Burr and me free reign to develop the character. Every time he could “hear” me wearing a shirtwaist dress, he would remind me that I was a superhero! What challenges were involved in recording SF? Creating the various characters who showed up each week. Our paycheck [bought] the producer the main voice and two smaller parts. Were there any you ended up being disappointed with? No, Wally and future directors were on top of the quality. It must have been a different feeling in the 1970s to see your show on TV and then feel you might never see it again because VCRs and DVDs didn’t exist yet. Do you now own any Super Friends DVDs? Never crossed my mind. Voice-over work was simply a part of my career, not the whole thing. Yes, I do own a DVD and watched some of it. How much time, if any, did you spend with the other voice actors when you weren’t working? None except an occasional party. Which voice actors were you most friendly with? The regular cast that worked every episode. 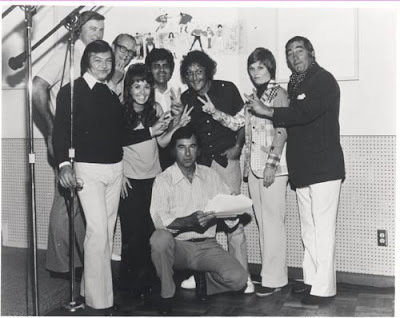 They were a great, talented bunch. If so, any interesting stories about the voice actors? Fun looking back at a minor role taken by a young voice actress named Nancy Cartwright—who [then] made history with The Simpsons. Which cast members (besides Michael Bell) are you still in touch with today? None, although I’ve worked with a few doing promos over the years for Cartoon Network. Do you still have any fan letters from the 1970s or 1980s? They never stop coming in—amazing! 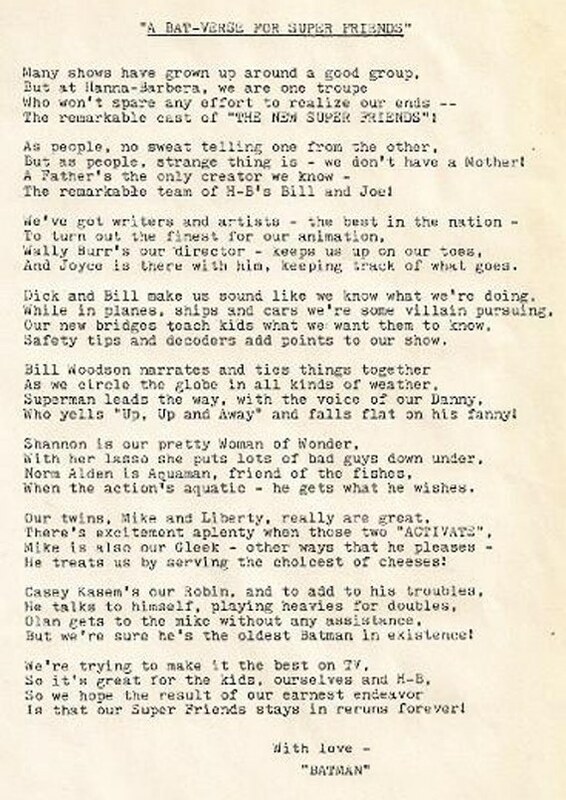 Do you still have any fan letters from the 1970s? Dumped a huge box of them [in 2009]. How did they get to you—did they come straight to your house or go through your agent/studio? Yes, in both photos. The seven members are cast only. The nine included a guest, John Stephenson, and director Wally Burr. Photo courtesy of Norman Alden. Did you attend any of the parties at Danny Dark’s house? Do you have any other SF memorabilia from the era (i.e. birthday cards signed by cast members, etc.)? Two cels from the show and (who knows where) a kudos letter written by Wally Burr. A 12x15 superheroes poster book from 1978 with an introduction by Isaac Asimov. I wish I had thought of asking the cast to autograph their characters in it. 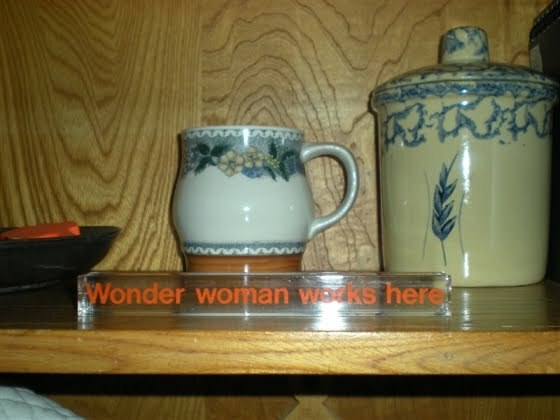 Where did you get the Wonder Woman sign in the photos you kindly sent me? It was a gift years ago. Sea World water skier Diane Smith—have this sign! Rarely. The address is not hidden but they would have to know it. You mentioned that people still ask you to do the Wonder Woman voice. Does that mean people on the street sometimes recognize you? No, I have done celebrity volunteer work for the Special Olympics over the years and the athletes love it. Also, occasionally a child will learn I do the voice and ask me to do it. When was the last time you watched one of your SF episodes? When I bought the DVD. What do your children (and grandchildren, if applicable) think of your time as a superhero? Took it all in stride—mommy/grandma is an actress, a big “so what” for them. The thing that matters to them is the quality time I spend with them. Is your daughter still teaching art in LA? Yes, she is in the elementary school for LAUSD as a roving art teacher. She handles seven to eight schools a year. There are about 250 art teachers doing this. It is now the only art teaching the elementary schools have. It’s a crime. 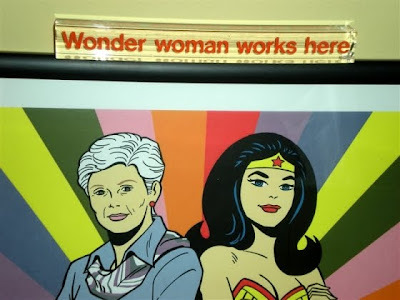 You have quite a pedigreed family—one daughter is Wonder Woman, another is a Von Trapp [her sister Charmian Carr was the oldest daughter in The Sound of Music]! My mother Rita Oehmen sang and danced with her brother in vaudeville as “The Oehmen Twins.” My father Brian Farnon (orchestra leader at Harrah’s Lake Tahoe for 30 years) and his brothers Robert and Dennis were well known in the music industry. [You already know about Charmian Carr.] 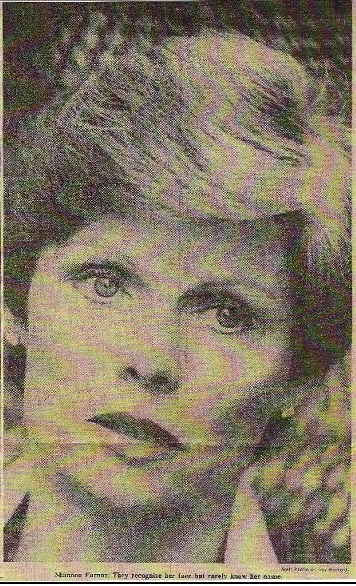 Our younger sister Darleen Carr has also [had] a lengthy career as an actress. Where do your sisters live now? How often do you see each other? Charmian lives within ten minutes. Darleen lives a couple hours from here. We each lead busy lives and talk to each other more than we see each other. Your bio mentions you do some editing/proofing. What kind of editing specifically? Printed material, people’s newsletters, websites. I was blessed with a good grammar childhood. What do you do as a member of CERT (Community Emergency Response Teams)? I used to be a glorified traffic cop for them. I no longer participate but am prepared to help my neighborhood in case of a disaster. How did you get cast in student films? They are readily available through castingnetworks.com. The colleges put out a call and if one likes the role, one submits oneself and is considered. There are so many—I could be doing nothing but that, but I am choosy. If you enjoy reconnecting people, here’s an idea that Wally Burr and I share: a Super Friends cast reunion! Most if not all are still in the LA area. What do you say? Party, anyone? A party with everyone would be lots of fun. Had anyone else interviewed you about SF before the Toon Zone interview in 2009? Yes, Starlog #26 (9/04), by Pat Jankiewicz. Have you ever participated (i.e. signed autographs) at a comic convention? If not, would you be willing to (if the convention paid your way)? No, I haven’t. It would take a lot of money to convince me to do it. 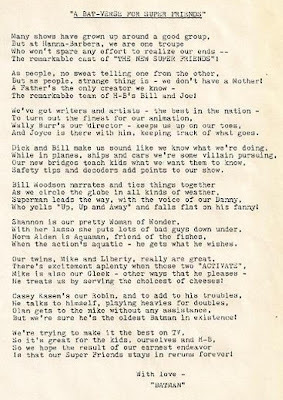 Thank you for sending the poem Olan Soule wrote! That’s great! Did he date it? (I’m estimating 1977.) And do you know if he gave it only to you or if he made a copy for the whole cast? It isn’t dated. He gave it to everyone. How do you look back on your time on SF? With great joy and having the pleasure of working with such unsung, talented people. Next: Constance Cawlfield (Wonder Woman 2). Great interview Marc--it really is surprising how rarely WW has made it onto television screens. In the final year of Super Friends (Global Guardians?) WW was voiced by a different actress--we've got all of the SF DVDs, and it's a jarring change. Shannon Farnon's the best. Thanks Quinn. Yes, there were TWO other Wonder Womans on SF...last two seasons. And both are on deck for the next two interviews, tomorrow and Saturday. a fast one, (and ironic, since i'm having lunch with her vocal director , (and my old filmation boss, lou scheimer), on sunday), but it was filmation's main female voice person (and one of the all-time best, PERIOD), jane webb who performed ww's voice for the brady kids' guest-shot/backdoor pilot. I loved this interview Marc. 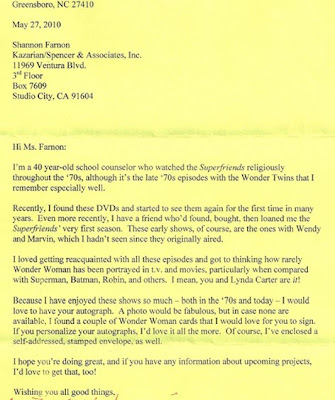 Shannon was nice enough to do a Wonder Woman recording via a mutual friend. Hello Darrell McNeil. I want you to know how much I thoroughly enjoyed your interview with Marc and learning more about one of my all time favorite series, The SuperFriends. When you worked at Filmation, did you have any involvement with my favorite Filmation toon, The New Adventures of Batman? Or was that before your time at Filmation? That toon was my first exposure to Batman and it led me to the SuperFriends. Anyway, I'd like to invite you to check out my website, Will's Ultimate SuperFriends Episode Guide sometime. Again Marc, this was a great interview. I loved the pics and the poem and fan letter. Darrell - I should've known to ask you! Thanks. And drop in on Will's site (just Google "Will's Super Friends.") He's a really nice guy. Speaking of which, thank YOU, Will, for your kind words. Just came across these a week ago. Great interview! 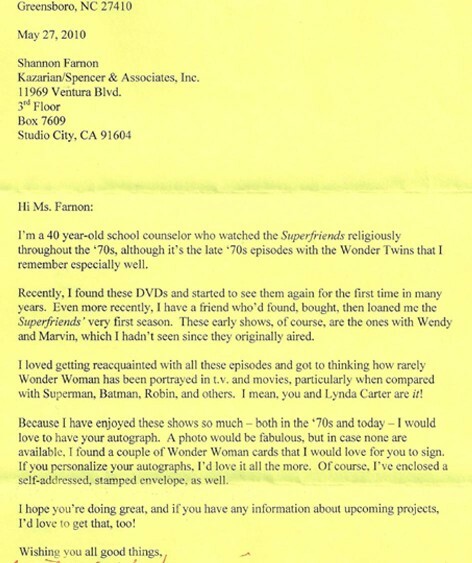 After reading this I found Shannon's website and ordered an autographed WW photo. She was so nice E-mailing me thanking me for the order and I had the photo in no time. I'll treasure it. Nothing against the other actresses but she is THE animated WW in my eyes.